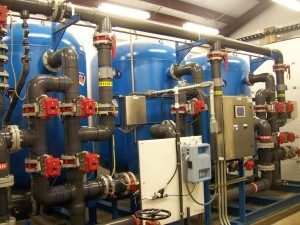 AdEdge Packaged Unit (APU) systems are designed, packaged, and assembled as a turnkey treatment solution for a variety of contaminants. These systems arrive at your site ready to hook up and begin operation. With a variety of custom options available, APU systems are custom designed and engineered to meet the specific needs of your site. APU systems are available in a variety of flow rates and configurations to meet the treatment needs of groundwater and surface water applications. Primary contaminants treated with an APU system include Arsenic, iron & manganese, uranium, radium, hydrogen sulfide, fluoride, nitrate, and many others. AdEdge Packaged Units (APU) systems are rated from 5 GPM to 20 MGD. Systems require minimal space and site engineering for simple permitting. Customization is available including composite or carbon steel tanks, automatic controls, backwash recycle system. APU systems can incorporate one or more treatment processes for a complete packaged unit.